In the Summer of 2013 we had an unexpected but urgent opportunity! 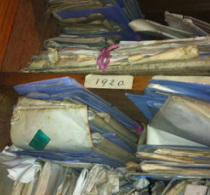 150 years of solicitors files were to be destroyed if we couldn't find a place for them! The old Edmundson & Gowland Office on Millgate was being cleared - after a hot week of packing and sorting we had rescued 32 boxes (about 25,000 records) and had started the LONG task of cataloging them. NEWS FLASH - JULY 2016 FIRST LIST OF 3910 PAPERS AVAILABLE TO SEARCH!!! This worksheet is a listing of all documents that have so far been cataloged by The Making of Mashamshire, from the Edmundson & Gowland Collection. The documents are listed for the period 1850 – 1930. As advised by the Law Society, documents are held beyond 1930 but are not available for public access. Documents held earlier to 1850 are lodged at North Yorkshire County Records Office. The documents are not held at the Library and have to be retrieved from archive. This takes time and is dependent on workload. Masham Community Office may be willing to scan retrieved documents with a suggested donation. It is worth noting that the majority of personal probate documents and wills are publicly available via the National Archive. Land Registry documents are publicly available via the North Yorkshire Records Office.